Meta: Your child’s first dental visit can be a stressful endeavor. Not knowing how your child will react can be hard to prepare for. However, there are steps you can take to make your child’s first visit a positive one. Contact New City Family Dental Group to learn more and to schedule an appointment. The dentist has a reputation for being unpleasant, and it’s common for people to struggle with anxiety surrounding a dental appointment. Children especially are susceptible to developing a fear of the dentist. New City Family Dental Group is a family dentist’s office dedicated to making everyone who comes to see us comfortable and feeling right at home. It is possible for your child to enjoy their dental visits, and that comes with creating a positive association from the first visit on. 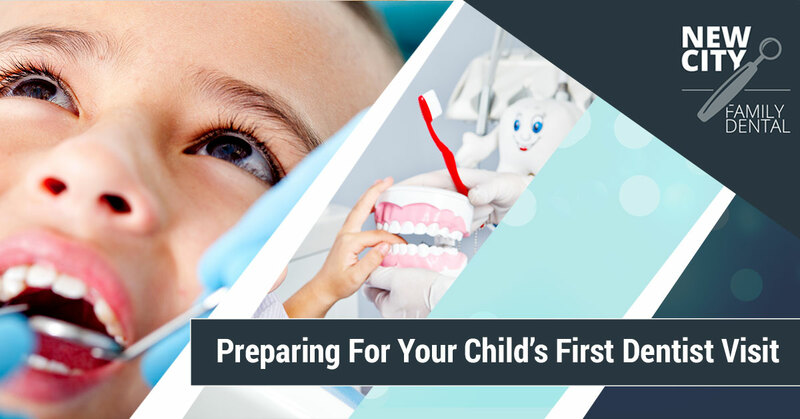 This blog is a guide to preparing yourself and your child for a positive first visit to the dentist. It is recommended that you take your child to the dentist as soon as their first tooth emerges. That oftentimes is at a very young age. A child’s first tooth can come in as soon as six months of age. When they’re that young, there’s not a whole lot to do to prepare them for their first visit. How you can best prepare is to make sure your dentist is family friendly. A family dentist will have experience working with young kids, and know tricks to make your baby’s first dental visit pleasant. Taking them at a young age gets them used to the dentist early, and will help them not to be scared of it as they get older. Sometimes parents think it’s a good idea to take a young child with them to the dentist to show them that the dentist is nothing to be afraid of. Do not do this. Bringing them along can make the situation worse and create more fear. Watching you go through a dental procedure can be overwhelming between the noises, the lights, and all of the people in the office. Overstimulating a young child doesn’t make for a positive association, and often creates stress. Also, most adults do not enjoy the dentist. If you are anxious about your dental visit, your child will pick up on that. Family dental offices know how to make children’s dental visits pleasant and stress free. Many offices are now implementing movies and games so that children have fun during their appointment. When your child is as young as six months, they will fuss. It can be scary for a small child to have a stranger in close proximity to them, let alone looking at their mouth. The best way to prepare is to stay calm so that they don’t pick up on your stress, and to go in mentally prepared for your child to fuss a little bit. As soon as your children’s teeth come in, start brushing. Brush their teeth for them when they’re super young, and then as they get older teach them how to do it themselves. Starting young will help them get into the habit of taking care of their teeth, and prioritizing dental care. The healthier your children’s teeth are from the get-go, the less frequently they will have to go to the dentist. For the beginning of teeth-brushing, it is recommended that a soft-bristled toothbrush and plain water are used. New City Family Dental Group is a family dentist’s office for all ages. We are dedicated to creating a comfortable, safe, and pleasant environment for everyone in the New York area. Contact New City Family Dental today to schedule an appointment or visit.